Cyclopia capensis T.M.Salter, Cyclopia galioides Eckl. & Zeyh., Cyclopia genistoides Walp., Galega genistoides Thunb. var. b., Sophora galioides P.J.Bergius, Sophora genistoides Thunb., Sophora genistoides Thunb. var. genistoides (P.J.Bergius) Richt. 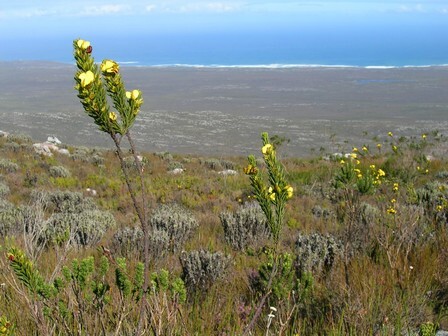 A range-restricted species, EOO <460 km², that is well protected and locally common in the Table Mountain National Park. Rocky, sandy Table Mountain Sandstone. No severe threats: most of this species' range falls within the Table Mountain National Park. This species resprouts from a woody rootstock after fire. Helme, N.A. and Trinder-Smith, T.H. 2006. 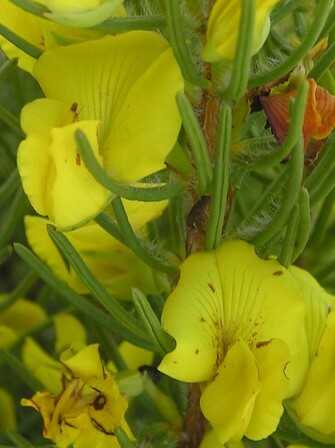 The endemic flora of the Cape Peninsula, South Africa. South African Journal of Botany 72(2):205-210.